The THeMIS unmanned ground vehicle (UGV) developed by Milrem Robotics has become the unmanned ground systems industries standard tracked UGV. During this year’s Eurosatory a record of four THeMIS UGVs will be displayed with three different applications. These include functioning as a remote weapon station outfitted with large or small calibre weapons, detecting IED’s, operating as a drone platform or a remote surveillance station. 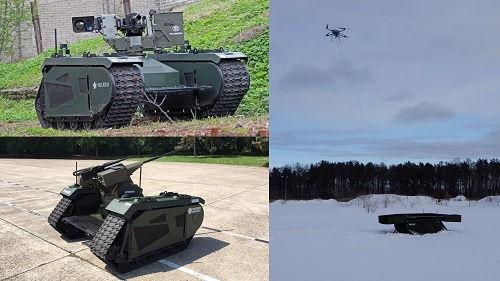 At Eurosatory three such integrated products will be exhibited: the THeMIS with Nexter’s ARX20 RWS, THeMIS with Threod Systems UAV and the THeMIS with deFNder RWS from FN Herstal. The latter will be exhibited at FN Herstal’s booth as well as at the dynamic demonstrations area. “The Threod Systems Tethered UAV and THeMIS integration is a notable capability multiplier. The system provides a fully autonomous ISR tool for information collection, reporting, situational awareness and situational understanding. Moreover, the system works as a radio relay to extend network coverage in the area,” stated Villiko Nurmoja, CEO of Threod Systems. “OPTIO X-20 which is the combination of the THEMIS platform and our ARX20 – 20mm RCWS – makes a fantastically capable system by merging outstanding fire power and mobility capabilities,” said Frédéric Bouty, Director of Strategy Department of NEXTER. “The combined solution of deFNder® Medium and THeMIS, merging the technologies and expertise of our two companies, illustrates the potential of the concept”, said Vincent Verleye, COO of FN Herstal. 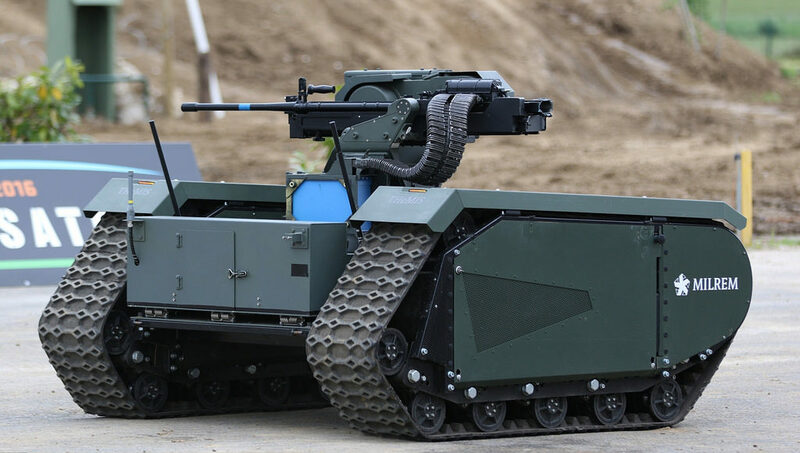 “The added value of such a weaponized robotic system is self-explanatory, and FN Herstal, as a leading defence weapon systems integrator, is proud to demonstrate the deFNder® Medium RWS during Eurosatory dynamic demonstrations alongside Milrem Robotics,” he added.